Every WordPress user has their favorite plugins which they like to use on all their sites. We have our own set of must use WordPress plugins. In the past, you had to manually install each individual plugin for every site that you setup. In this article, we will show you how to bulk install your favorite WordPress plugins. This will come in handy if you manage multiple WordPress sites and need to setup new WordPress sites regularly. First thing you need to do is install and activate the WP Install Profiles plugin. After activation, you need to go to Plugins » Bulk Install Profiles. You will see a default list of plugins there at first. If you want to use a plugin from that list, then keep the ones you want to use and delete the rest. You can also add new plugins to this list as long as they’re available on WordPress.org. To add a plugin, you need to add the name used in the plugin’s URL slug. For example, if you want to add floating social bar, then you will enter either floating-social-bar or floating social bar. Once you have entered all the plugins that you want to install, you can give this list a profile name, e.g. MyFavoritePlugins. After that you can save the profile, or click on Download plugins and save profile. This plugin will now install all the plugins from your list and show you a link to download your profile. Click on the download link to save your profile and to use it later in other WordPress installations. To re-install these plugins on another WordPress installation, you need to install and activate the WP Install Profiles plugin on the other site. Upon activation go to Plugins » Bulk Install Profiles and click on the Import Profiles tab. Now you need to upload the profile file that you downloaded earlier by clicking on the Choose File button and locating the file in your computer. Click on the upload button, and the plugin will import your profile. On the next screen you can select it by clicking on the drop down menu next to Choose your profile option. As you choose your profile, you will see that all your plugins will appear in the list below. All you need to do now is to click on Download plugins and save profile button. You can repeat this process on as many sites as you like. 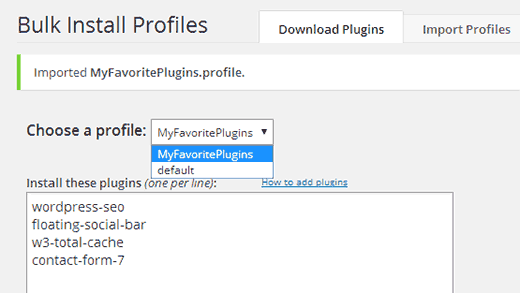 You can create different profiles with different plugins to suite your needs. 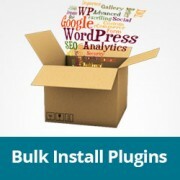 We hope this article helped you learn how to bulk install plugins in WordPress. For feedback and questions, please leave a comment below. Also don’t forget to check out our YouTube channel for WordPress video tutorials. What a shame. The plugin seems to be abandoned. I was looking for this solution for a long time. This will install and activate the add-in. Very handy to install plugins in bulk via SSH. You can prepare the list of plugins in a text file and then process all at once. Unless you are just wanting to let us know that you know of a different way, would you mind giving more details? What is wp tool, and is the command run in root? It would be great to be able to install plugins on all domains on a sever at once. Many thanks for this great idea. Is it possible to bulk install premium plugins as well? If yes, how can I get it. Thanks again and stay blessed. That’s be a great idea for client websites. There should be an option to edit comments within 5 minutes, lol. I’ve been using Plugin Central to do this for a few years. It doesn’t have the option to save a profile like this plugin does, but I just keep a list of my favorites in a text document and copy the list whenever I do an install. It does, however, have the option to activate all the plugins after installation. * And, yes, Floating Social Bar is on my list of favorite plugins to install! Thank you so much for the alternative Barbara. The Bulk Install Profiles plugin was giving me a hard time now and then. Plugin Central works like a charm. That’s brilliant! I can say I’ve got core plugins I install on every site such as Yoast’s WordPress SEO or SEO Images, database management plugins, sitemap plugin, etc. I think this WP Install Profiles plugin comes handy. Could one desable the plugin after install the plugins? Nuno, this plugin will only help you install the plugins, it will not auto activate them. You will have to go to Plugins screen and check all plugins and then use Activate from Bulk Actions and apply. To disable plugins you can deactivate them one by one, or bulk deactivate them.